In March right after my birthday, I caught the circulating community bug. Cooks Note: The recipe calls for Broccoli Rabe, a delicious, bitter vegetable. I love it, unfortunately, our fresh market was out, rather than not make this lovely dish, I did substitute spinach and although it is mild with the spinach, it is still a wonderful dish. While chicken is baking, cook polenta in the usual manner. 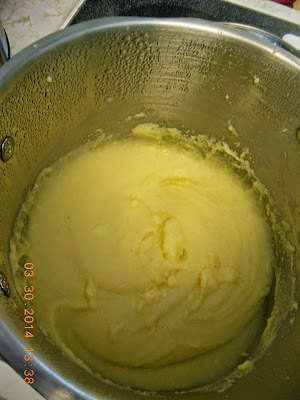 When done, add a knob of butter, stir well. Cover and keep warm. When ready to serve, you may need to thin the polenta by stirring in a few tablespoons of boiling water, whisk until smooth. If you prefer your polenta more stiff, you may skip this step. * Laurie Colwin was a salt-free cook, the addition of the garlic salt and sea salt are my own. While we do not cook with a lot of salt in this house, but these amounts are needed. 6 comments poultry, Recipe rating Oh Yes! I have never read any Laurie Colwin. It sounds like I have missed out. And. . .your chicken sounds delicious. Greens with grits (or polenta) are right up my alley. Especially when the greens are spinach. 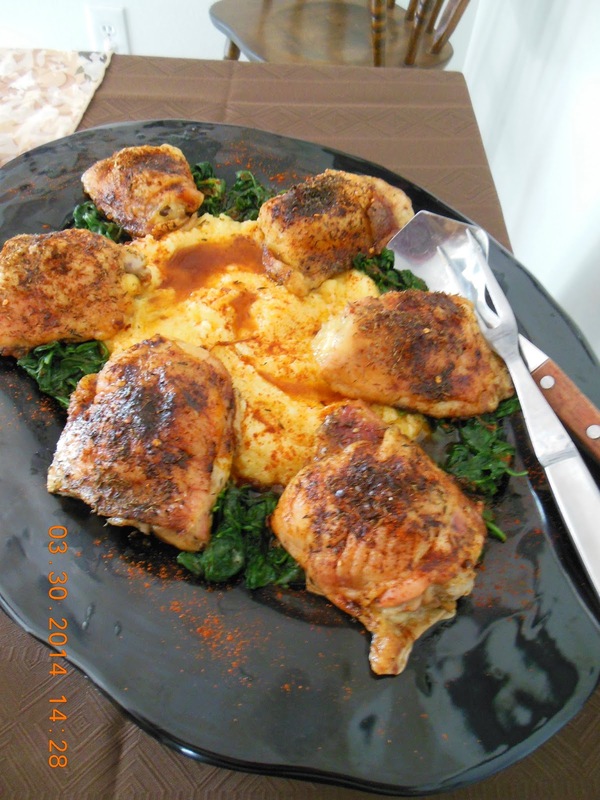 The chicken looks perfectly glazed with savory, spicy, and sweet flavors. Thank you for stopping in and linking with See Ya in the Gumbo this week. I've only cooked polenta once but it does sound good with your chicken dinner. I hope you have a healthy week. I've never cooked polenta, but I love ordering it when I'm out - I'm pretty sure that means I should give this recipe a try! I haven't heard of the author, I'm glad you are enjoying her books and her recipes! A delicious meal. I have never cook or eaten polenta before, though have seen lots of recipes using it. 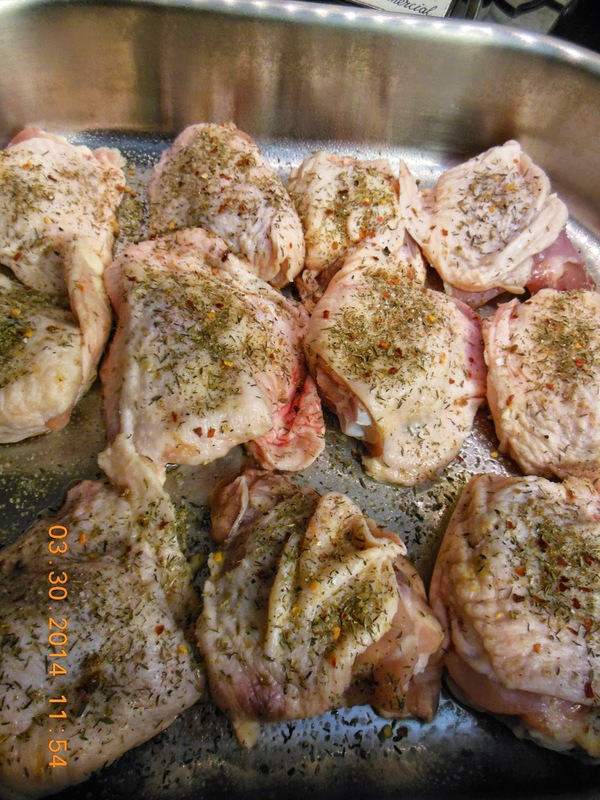 The chicken looks delicious, with pepper and thyme, already sound good to me!